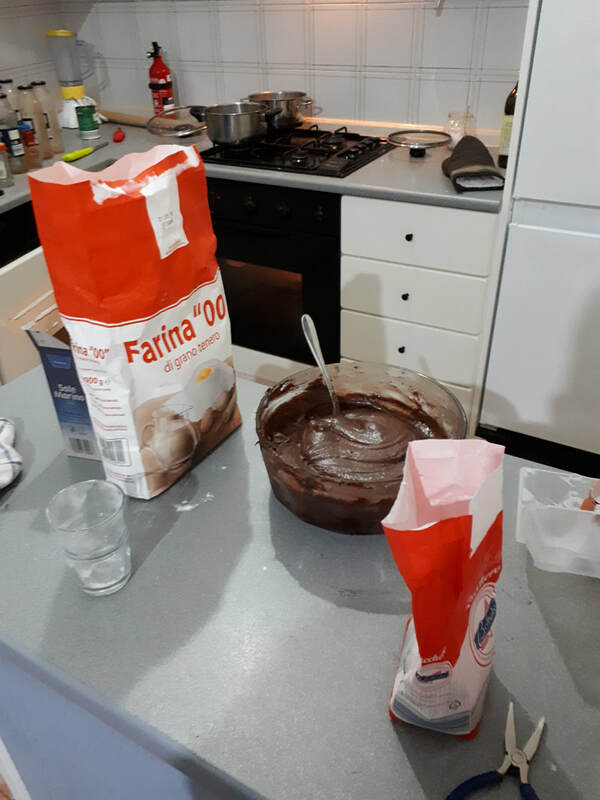 First picture is of the brownies in the making. 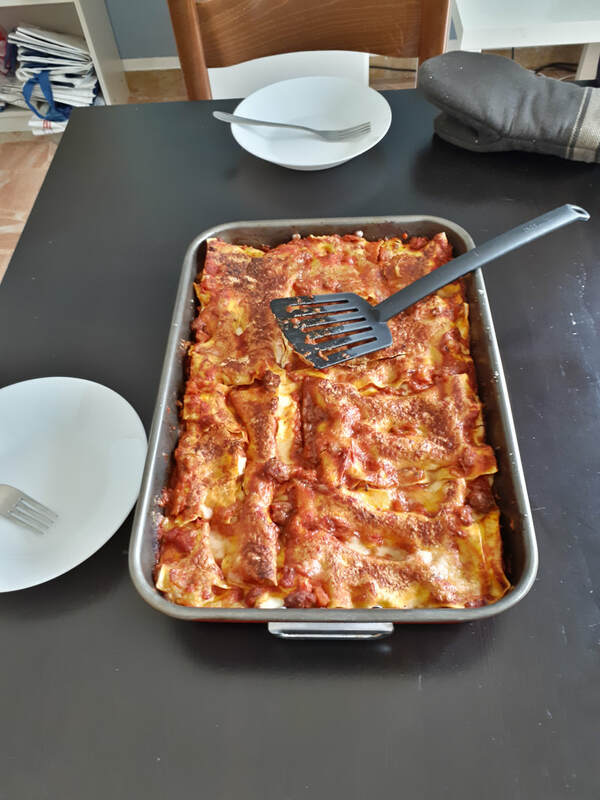 Second picture is a random day last week when we decided to make a hefty 7-layer pasta. This week was exciting! Because of transfers we got put in a trio with Anziano Bacon for the first half of the week here in Pescara. That was exciting. Being in a trio always adds a different dynamic to things. Later on in the week we did a lesson with Emanuela, a Brasilian member, and her non-member Italian husband, Adamo. In light of the suggestion from our ward mission leader, we decided to invite Adamo to be baptized. He has been coming to church for years. He knows our church extremely well, but we don't think he has ever been officially invited to be baptized so we decided to try! For the lesson we started out by reading Mosiah 18. We read the first ten verses and then began talking tabout baptism. It was super intense but we just went for it and invited him to be baptized and do the necessary things in order to prepare for it. I half expected him to just say we were crazy and deny it, or have a change of heart and say yes. Well he did neither and just responded saying that he's never really felt like he needed to and that he just doesn't see the point. Well, we explained many things to him including the fact that baptism is one of the necessary steps to having an eternal family, but he didn't really say much. It was kind of sad because Emanuela kind of went off on him for a bit telling him he needs to do this or that. In the end though, it has to be Adamo's choice. He did commit to start praying consistently everyday though. It's a small step, but it's the right step. We will just have to be patient and do some praying of our own! The highlight of the week was for sure last night. I'm not even sure how to put this, but pretty much we got invited to a birthday party of a Nigerian member's 4-year old daughter. Now if that sounds like it might be boring, I will tell you very quickly that it wasn't! It all started when on Sunday in church we went up to the mom, Tessy, to see when we could come by that week to do a LESSON with them. This family is so so busy and we have literally been trying to get an appointment with them for weeks. She was in a hurry to leave, but mumbled something about how we could actually come to their house that night because her daughter was turning 4 and they wanted to have a little party. Well, we decided to go. We were planning on doing a gesso with the district at 6:30 so we thought we would just drop by and then head off to centro where the gesso would be. Well, when we got there, we went into the frontroom and there is a bunch of Nigerians all gathered together, some sitting some standing. Many of them were decked out in fancy African dresses. I don't know how to describe it all, but pretty much they were praying for the little girl whose birthday it was. Praying doesn't seem like the right word though. You could say they were "calling down blessings" upon the girl. At certain points there was one who was speaking a prayer while all the others would be shouting "Amens" and "Hallelujah's." Then they would break out into a ton of individual but still spoken prayers and then sing some hymns that I didn't know. Well, that was the first 15 minutes of the party. Then my companion was asked to give the opening prayer. All I have to say, is it seemed like the most boring prayer I have ever heard in my life. He got a handful of "Amens" and "Hallelujah's" so I don't think the Nigerians would have agreed, but then the Sorelle who un-beknownst to us had also shown up gave a spiritual thought. Then us and the Sorelle sang I Stand All Amazed. I also felt like our performance was pretty lame for that hymn too.  Well, the party got more hyped as we gathered everyone around the table to sing Happy Birthday and have the cutting of the cake. At the top of our lungs we spelled/yelled the letters of, "JESUS" and when we arrived at the last "S" the adorable 4-year old birthday girl brought the knife down on the pink frosted cake and cut it. As the chants and singing got loud and as I began rethinking everything I have ever thought that made a good birthday party, someone pulled out a big sparkling bottle with some clear liquid and began pouring everyone a glass. Now, I may not be the expert on my alcoholic beverages, but two years in Italy has definitely taught me what a bottle of champagne looks like. Nightmare visions started passing through my mind as I thought of the scene of us, headaches and dizzy showing up drunk to the gesso that evening and about the headlines of "District leader and companion get drunk at African party with two sister missionaries, one in the first week of her mission...." Ok. PAUSE! PAUSE!!! Don't freak out. I refused it, they showed it to me and read that it didn't have alcohol so I ended up drinking a sip. It definitely wasn't alcohol. It just tasted like sparkling cider. Anyways, time is up! I have to go. Please don't worry about me. It was all good. Our mission decided to change some things and so we now receive transfer calls Monday morning instead of Monday night. That being said, I will be sticking it out hear in the beautiful city of Pescara with my dear companion Anziano Heywood! This transfer is kind of a fun one because there are, no joke, 25 new sister missionaries coming in this week!!!! Then next transfer there is like 30 missionaries going home (about half and half anziani and sorelle). That is a lot of turn over in a short amount of time! The reason why there are so many sister missionaries coming in is because they, or at least many of them, are visitor center missionaries for the temple! We are all just praying that they can learn Italian in time for the open house in January. 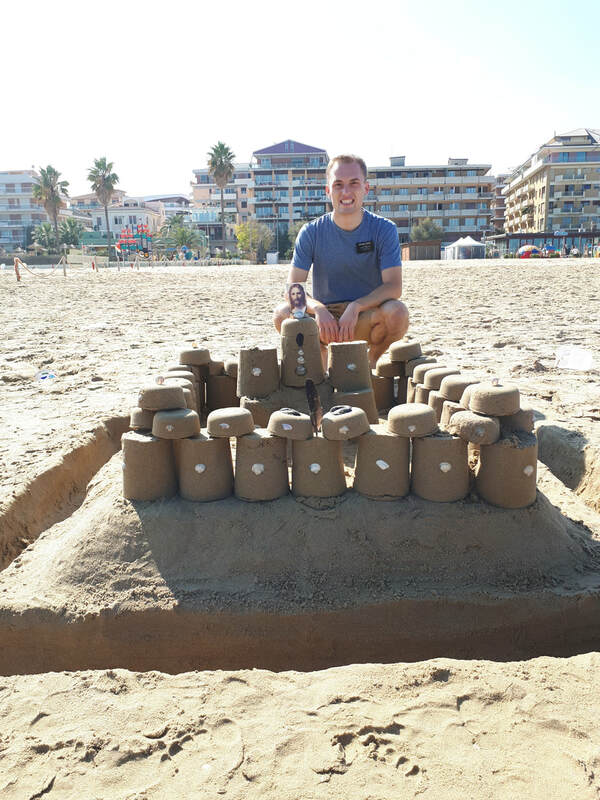 In light of that, our mission has also made a big intuitive to push everyone to speak Italian more so now, from 10 in the morning until 9 at night unless we absolutely need to, we are supposed to speak Italian (P-days, companionship studies, and weekly plannings excluded). Exciting times! I don't know how to sum up this week. It's been interesting with a lot of ups and downs. Fun fact, a man named Camillo from Switzerland (he is originally from Italy though) came to church here on Sunday and he knows a ton of Stucki's in Switzerland!!! He is not a member, but has a lot friends in the church here in Pescara and agreed to let us come to his house here near Pescara to talk about the gospel. I didn't know why, but I felt strongly that we should bring a member to the appointment. We spent half of the week trying to find a member to come with us/give us a ride, but no one could so we took a train to the city of Manoppello where he leaves. We only had two hours to be with Camillo (which for an Italian meal appointment is no time!! haha) so we ate quickly and then got ready to share our message. Well, before we could start, his brother who by the way was also there and who is a member of our church, but less-active, started talking with Camillo about the missionary rules. The fact that they were even talking about the mission rules was pretty pointless and ridiculous especially because Camillo started getting really heated and started talking bad about them. I just thought to myself, "Wow if he is so against our mission rules, which don't even apply to him, I feel like we are not going to get anywhere with him with talking about our church's gospel..." To my disappointment but not to my surprise, a second later they started talking about certain commandments that we have in the church. His brother kind of defended the church, but was content in saying that even though he understood the reasoning behind the commandments, he was content and convinced that he couldn't and wouldn't follow them. Camillo went on and on bashing the commandments and our church. Up until that point I hadn't really said much, but I quickly came out and pretty much just said, that in the end it just depends if you believe Joseph Smith was called by God or not. That was the only thing I got to say. Camillo just exploded. Cutting me off he went on to deny everything and continue bashing. After a minute or say we offered to say a prayer and then rushed out the door to catch our train back to Pescara. The next day in church was my favorite. We sat in the chapel waiting for our investigators to come. To our disappointment the meeting soon started, but none of them arrived. The first two talks came and went. Then me and the two sister missionaries got up to do a musical number. We had chosen to sing, Joseph Smith's First Prayer to a favorite arrangement of Come Thou Fount that I had acquired from a missionary months ago. Me and one of the sister missionaries sang and the other sister missionary played the piano. My companion didn't participate at all. I feel bad, but I know he definitely preferred it that way. Hahaha anyways, I got up there and I sang as good as I possibly could. I tried to look at each person in the congregation in their eye as I bore my testimony of the Restoration of the gospel through song. The spirit came so strong. I thought about the night before as I listened to Camillo talk so rudely about things he didn't even understand and about the gospel and church that I love. I thought about how he interrupted me and how, being a native speaker, spued out ideas and phrases in Italian much faster than I could. I smiled as I sang knowing in that moment there was no one who would interrupt me and that my testimony would be accepted and recognized. Anyone with a pure heart wouldn't be able to deny the power of the Spirit as it declared that what we were singing was true. After we sang the last note, the room that was filled, was permeated by a profound silence. Several people had tears in their eyes. In the right moment and in the right place we had borne our testimonies and the impact it had was very apparent by the undeniable power and warmth of the spirit that filled the whole room. I think often to the words of Jeffrey R. Holland when he talks about the "songs sung and unsung." Sometimes our song is unsung because we are simply lazy and don't take advantage of the opportunities before us. Other times our songs are unsung because we simply don't have the strength. Try as we might, we never quite succeed at voicing them. But sometimes, last of all, our songs are unsung because others simply reject it and maybe even drown it out with a cacophony of doubt and bitterness. I also take a lot of comfort thinking back on another talk by by Anziano Holland. Even though we may try as hard as we can to sing our best and not "die with our music still in us", in the gospel, we always get credit for trying! And that is the basic and most fundamental lesson that we can ever learn. We never lose until we quite trying. We must never get discovered when things don't go as planned and it seems like our efforts have been fruitless. God sees our desire and he knows our hearts. He hears all the songs, those that sung and those that are unsung. I invite you all to never give up trying and doing what's right! I know God notices and the good news is that He blesses us for it. I love you all! Have a good week. It has been an awesome week! We had zone conference in Rome. It was so awesome to go back to that place! Tuesday night we went with the other missionaries of the zone and did a gesso in Piazza del Popolo. There were a lot of missionaries and so me and a few others got together and sang hymns for a bit. It was a fun experience! Anyways, this past zone conference was great! I found out halfway through that it was my last one and that was kind of freaky. It's my last one because even though there is still another transfer, next transfer we won't have zone conference, but instead a general authority will come speak to us! I am excited to write about this week because there is a lot to say and it didn't get the opportunity last week. First off, all I can say is, General Conference was so amazing this week! I actually have only been able to watch the Saturday and Sunday morning sessions, but I am so excited to watch the others. I heard about the temples being announced too and I am so excited. Being in a country that is about to get a temple for the first time, I was especially excited to hear about all the countries this time who will be getting a temple for the first time. 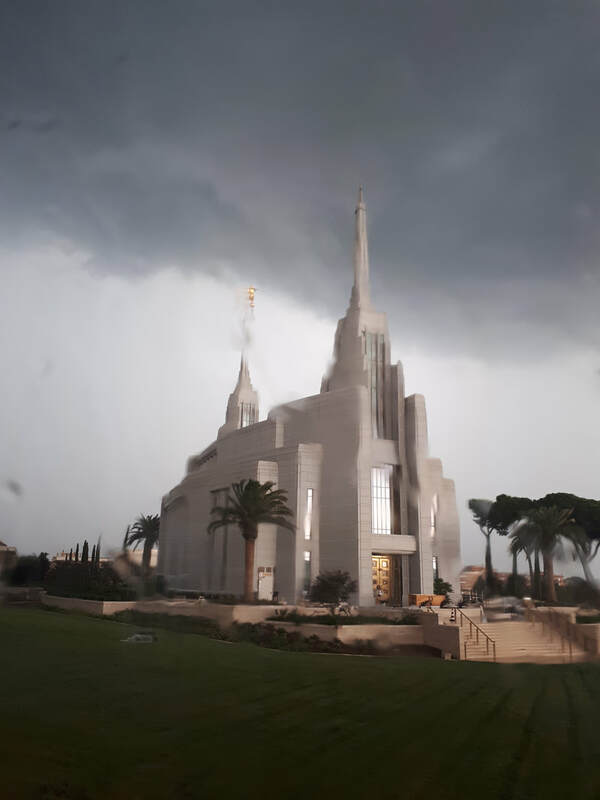 The temple brings such a spiritual power and lifts everyone's eyes higher than just baptism and going to church. Also, even though Nigeria already has a temple, I just have to say I am so excited for that temple. 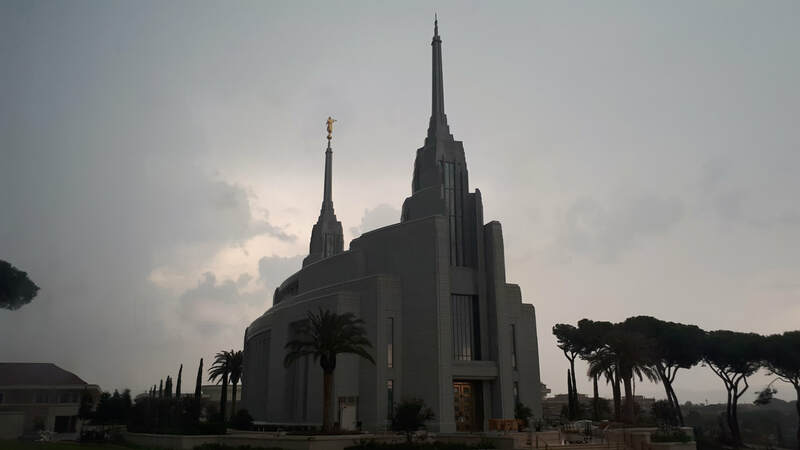 I have never served in the mission of Nigeria, but I, especially at certains points in my mission have definitely served in the "Roma Italy mission of Nigeria" and it is sweet! I can't wait to see the blessings that will come to those amazing people and the blessings that will come to their country which desperately needs it. Well, this has been an amazing week which I will remember for many reasons. One, which I will remember for years and years and years to come, will be the moment in the Sunday morning session when we were watching Anziano Bowen's beautiful talk with a bunch of members in the church where the session was being projected onto the sacrament meeting wall. 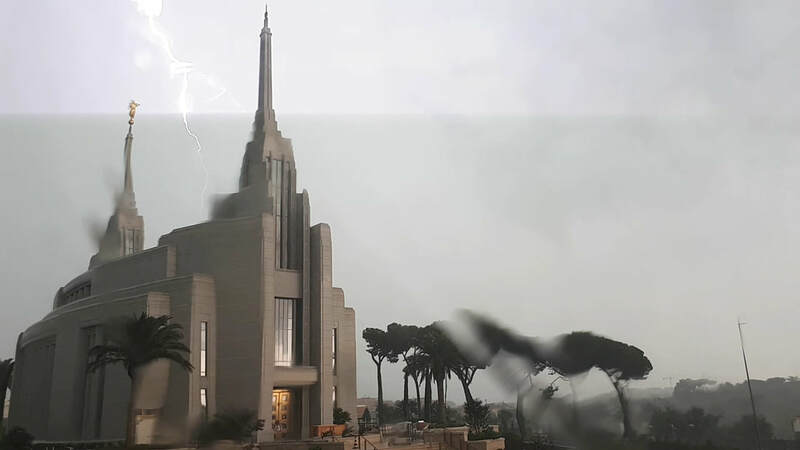 At a certain point Anziano Bowen standing on the conference center behind the pulpet disappeared and a video of a little girl playing with toys appeared on the screen. Let's be honest, in this conference they used A LOT of visual aids, which, don't get me wrong, I absolutely love! In fact a lot of my companions will kind of make fun of me as that one missionary where every time our investigator has a problem I instantly suggest to send them a Mormon Message or something. Hahaha What can I say... There is just something powerful about the combination of a beautiful track of music accompanied with inspired words of prophets and carefully captured visuals and camera footage . Anyways so in that moment everyone was confused, but no one really freaked out. A moment later the video went on as the camera spanned to show a cluttered room of toys most of which were pink. A moment later the video exited out of fullscreen view and we saw before us a YouTube page and upon reading the title of the video unraveling before our eyes, we soon discovered that we were watching an advertisement for Barbie on YouTube, BUT might I add, with the continual voice of Anziano Bowen that played in the background!! When I first saw that I was horrified because we had investigators and it totally interrupted the spirit of the conference, but it was only about 15 seconds before one of the bishopric counselors jumped up and with a quick flip through the menu using the projector remote, discovered that somehow the input on the projector had been changed from the broadcast of general conference to the tablet of a member's very very young daughter who was sitting in the chapel having the time of her life watching Barbie on YouTube!! We actually don't have a confirmation of that, but that's what me and my companion pieced together based on what we saw. In the end, it was so startling and confusin, but thinking back on the Barbie commercial detour, me and my companion spent a good amount of time dying of laughter later that evening when we got home. Hahaha well, just wanted to share that story with y'all so maybe y'all can laugh too. I'm not really sure what we can learn from this. Maybe first off, to make sure that when you are streaming general conference to your local church building that some child's tablet doesn't accidently connect to the projector screen. Maybe also we can learn that just as Anziano Bowen's voice continued on despite the fact that the screen changed, the spirit will always speak to us, but based on what we have before us (or in this case, what we are watching) it may be really easy or really hard to concentrate on its message. Well that's all I have time for for now, but just wanted to finish saying how much I loved President Nelson's talk about the correct name of the church. I know he is a true prophet of God and he really is inspired to know what to say and do. I am so glad to be a missionary and to teach people about the Restored church. I did a scambio last week in Ascoli Piceno (cue Google Maps) and at one point me and my scambio campanion, Anziano Bacon (Yes, that is his actual last name ), and I stopped this man on the street. This old man asked who we were and I was about to say the usual about how we are well-known as Mormons and so on. Well, thankfully Anziano Bacon took the lead and started out by saying how we are the Church of Jesus Christ of Latter-day Saints. The man looked confused and asked, are you Catholic? We said no, we are members of the Church of Jesus Christ of Latter-day Saints. He asked if we were Jehovah Witnesses. We said no, we are members of the Church of Jesus Christ of Latter-day Saints. And then in the next few minutes we began to explain how the church after Jesus Christ was corrupted and lost and how it has been restored on the earth today. He was so interested and began asking more and more questions and it turned out being the coolest and most beautiful conversation ever. I don't know what has happened with that man since, but I am grateful we chose to teach him who were really are rather than giving him a quick explanation that would have led him to simply make assumptions or be satisfied with whatever information he has randomly heard around town. I know we will continue to have more blessings as we obey this commandment and remember most of all, to never ever leave out Jesus Christ. Love you all, Anziano Stucki. 1. Gelato! Because good dolci don't care about the fall weather outside. Well I did get transferred. They say "All roads lead to Rome." All I can say is, "That's true, but apparently mine also leads to Pescara!" Haha for those of you who don't know your Italy geography, Pescara is located in on the east coast of Italy by the Adriatic sea. If you care about compasses, it's a bit more north than Rome. By bus it's about two and half hours from Rome. It's a lot smaller than Rome. There is no metro and the buses are a lot more scant, but there are no gypsies so I'm not complaining! Random fact, the city center has so many gelaterias! Not even joking, in like a square mile there are probably 30 gelaterias. That is definitely the highest concentration I have ever seen. For now I am considering that a blessing, but my bank account and bathroom scales might tell me differently in a month or two. Other random fact: We live like 1 minutes walk from the church and like 2 minutes walk from my favorite Italian grocery store (Lidl) so I'm also really excited about that! Haha Here there is us and a companionship of sister missionaries. My new companion is Anziano Heywood from Meysa, Arizona. He is so awesome! He is in his fourth transfer, but already knows Italian so well! He is also very spiritual and good at following the lessons in Preach My Gospel. Let's just say, I think the Italians are rubbing off on me a bit and I have the tendency to wander around in lessons a lot. Haha I am so grateful for this opportunity to serve with him. The church here is actually doing very well. There is a ward and they have an actual church building! As I said, the city is small, but there are also a lot of other little cities around it where various members live. I am grateful for this opportunity to serve here at Pescara. There is work to be done! Funny thing is, I have never been so determined in my life to push through this! We don't have many investigators and we need to improve the relationship with the members and missionaries. All I can say is, this city doesn't know what hit it! We have been trying so hard to talk to everyone on the street. I have never been so outgoing in my life! Haha I have definitely been praying a lot too. One night we exited the house and just had the impression to go a direction that we usually don't go. We kind of walked up this hill and there was no one. We pulled out our map and decided to walk down a road to our left. We went down there and met a few people. We tried talking to them, but they just waved us off. We walked down to a busier road. We crossed one lane and then were standing in this little divider when a lady walking her dog crossed the lane coming towards us. She too stopped on the little divider between the lanes. When she saw us she just came up and asked if we needed any directions. We said that we weren't we were just out talking a walk to go and share our message with people. We started talking and she expressed how much she just had given up on God. She said she had searched him so much, but didn't feel like he ever answered her. She said she saw us though and just wondered how we could do something hard like this and have such conviction. What was the power that motivated us and that she couldn't seem to find? We just bore testimony that God is there and that He loves us too much to let us wander, and that if we search for Him we can find Him. We talked about a lot of other things too. It was just so cool to see how we were led to her. I know God is leading us! We just have to follow the spirit. It will help us know what to say and what to do. Well, please don't worry about me. I am doing well. I am a bit frustrated about the money I lost, but in the end, I didn't lose anything of great monetary value so it really isn't that bad. I have kind of been praying every night that the man who took my bag won't figure out that in that bag there is a full set of keys for the church that he stole it out of, and that I won't get a call some morning from a bishop about how the church got vandalized last night. I think they are going to change the locks on the church soon. Yeah, about that, let's just say I'm kind of becoming famous among the bishops here in Rome. Apart from the things I lost, I guess you could say the one thing that I have gained from this experience, that I didn't have before, is a vivid understanding of how important it is to follow the Spirit. It really is a protector. So often I think of it as a protection spiritually, because he is a spirit, but thankfully for us, he is much more; he will protect us physically and temporally. We just have to listen to him. Wow, that story took a lot more space than I expected. I am just a firm believer that if you're going to tell a story you've got to tell it right! Hah Speaking of which, I said I was going to end this with the best part of the week. That would be yesterday when Bishop Waddell of the presiding bishopric came and spoke at our stake conference and then did a special meeting with the missionaries later that afternoon. It was one of the most spiritual meetings I have had in a long time. 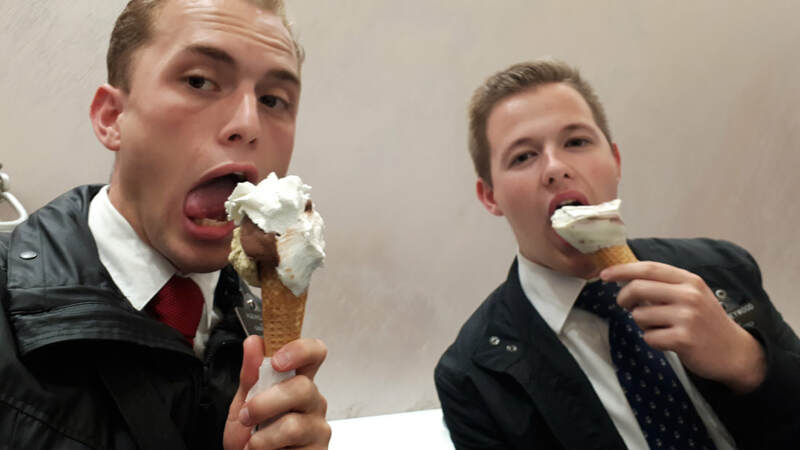 I could not be more grateful to have heard his advice at this point in my mission especially seeing that this evening I will probably get a transfer call to my last city in Italy. Before I get off topic though, I would like to just include some of my notes from his talks. He talked a lot about gathering scattered Israel. He shared the scripture that says "My elect hear my voice and harden not their hearts." He also shared with us 15 words from Jesus Christ that basically teach us everything we need to know about follow God and observing our covenants. I don't have time to include the scripture references for these phrases, but here they are. Bishop Waddell also added a comment saying, "Convenient and covenant are not often found in the same phrase." "Here am I. Send me." -I will do it as you say. I won't change the conditions. "Not my will, but thine be done." -I will do it your way. "It is finished." -He didn't stop until it was completed. Bishop Waddell concluded by saying how we will be able to look back on this experience (our missions) and say, "I can do hard things, with the Lord's help." If I am learning anything from my mission, that is one of the biggest lessons! I know God can help do what is necessary. The point is that we need to just do what is necessary. Allora, this past week we had zone conference. Purtroppo I didn't get any pictures, but it was awesome! They talked a lot about loving our mission and seizing the day. In my interview with president he just asked me what my biggest concerns were. I said I just wanted to finish strong. He gave me advice as always and promised me that at some time or another I would have a confirmation that my mission was successful. I thought a lot about that as I went into zone conference the next day. We went through most if the conference and all the trainings and testimonies were good, but I didn't feel especially impacted by anyone in particular. It wasn't until the very end of the conference when there were the missionaries who will be going home this transfer bearing their testimonies. This time it was a sister missionary who bore a simple and powerful testimony of Jesus Christ and the Atonement. I don't even remember what she said that made me think this, but I suddenly thought about many many people who I have met in my mission who, when they pray about the church or about the Book of Mormon search for signs to prove to them that these things are true. I also thought of how we are so often warned to not look for signs, but that those who believe without great signs will be blessed. It is a very wide misunderstanding and it can be frustrating with all the people we meet who think like this. In the moment a thought came to me that I had never considered. I realized that that is the way I was thinking! I looked at this sister missionary who had been an outstanding missionary. Her mission had been built from the bottom up of small but numerous acts. I realized that mine was like that too. I didn't need to search for a one or two big moments that define my mission, but rather continue to do the small things that contribute to the final outcome. Also, this past week we also had a very unique experience. Thursday was the most packed day ever. We had quite a few lessons and had to run around everywhere. We went around to different things in the morning and had a couple of lessons and then didn't return home until about 3:30. We hadn't eaten lunch yet and (long story short we were trying to save money last week and so we didn't buy very much food, but maybe we tried a little too hard because we kind of just had a lot of random wierd foods so I couldn't find very much to eat and kind of just didn't eat very much food at all for breakfast haha) we were just going to go make food really quickly when our zone leaders called and said there were some missionaries from Slovakia who had an Italian investigator who didn't speak Slovakian at all and English only a little, and so they wanted to do a Skype lesson with us, them, and her so we could communicate to her better since we speak Italian. We agreed and then a bit later the Slovakian missionaries called us and we talked with them for a bit about the Italian woman (Antonella was a her). The lesson was going to be at 5:00 and by the time we ended up finishing talking to them on the phone it was 4 and we still hadn't eaten! I swear there were angels helping me as chopped up peppers, potatoes, and onions practically flew from the cutting board to the frying pan. I ate at fast as I could and then we rushed out the door to go to the church's institute building where we could use Wifi. We arrived just in time and we began the call. The other missionaries just kind of sat off to the side and we just went off talking to her in Italian. She is from Northern Italy and just moved there to Slovakia because of her husband's work. After awhile we handed it back over to the other missionaries and they taught her the lesson they had prepared as we translated and expounded everything in Italian. It was such a unique and cool experience. Antonella was so nice. She has A LOT of doubts though. We focused a lot on just how she can recieve a testimony of these things. We invited her to pray and read the Book of Mormon, but she wasn't convinced that that would help her. She even doubted if God even existed or if she could recieve an answer from him. We invited her to just try it and she kind of just said, "We'll see!" We had a long conversation with her and finally at the end just invited her to say the closing prayer. She did and in it said that she hoped something good would come out of these lessons. That's kind of where we are at with her. We can definitely promise her that good things will come out of this, but she will need to do something if she wants to find out for herself. Anyways, it wasn't at all the outcome we wanted from the lesson, but it was a really cool experience and we should have another call this week so we will pray that things go better and that she can just exercise a little bit of faith!! Anyways, that is my assaggio for y'all this week. It's been another week! Things are going well here in Rome. This past week was so full! On Wednesday we did a zone afternoon of finding. Pretty much from 4:30 in the afternoon until 9:30 at night our whole zone just went out on the streets and did finding in our various areas whether it was on the bus, the street, the metro, parks, anywhere! We were all connected too because we had a zone WhatsApp group and everytime each companionship made attempt to talk to someone (whether it was successful or not) they sent the stop sign emoji or if we gave a Book of Mormon away we sent the Book emoji or for a citifono rung the house emoji. Haha it was fun and as you can imagine basically all evening the chat was blowing up! For me and Anziano Castro, after doing finding for several hours straight had had several good conversations, but we hadn't received any new contacts. We found ourselves in this kind of abandoned park when it started raining. We felt pretty discouraged and went under some trees and sat on a bench to reevaluate our progress and talk about what we could do differently. We said a prayer together and then began talking to people again. We left the park soon after and then it started raining once more. We ran to stand under the overhang of an apartment building roof. It was raining a lot so we finally decided it would be best to finish out the evening just talking to people in the good'ole underground dry metro. When there was a break in the rain we headed down a street that we thought would take us to a bus stop where we could take a bus to get to the metro. On the way we ran into a man and asked him where the nearest bus stop was. We began talking to him and he asked who we were. He spoke English and so we started talking about how he had studied and school. Then his friend came along who also spoke English. 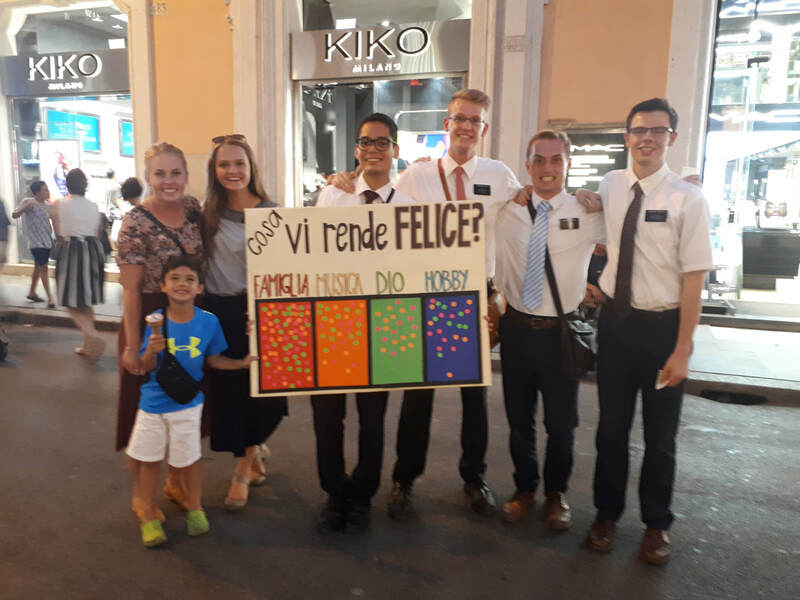 The conversation after awhile came to an end and they started to say goodbye when I interrupted them and just asked if we could leave them with a Book of Mormon. I gave a brief explanation about what it was and added how much it had had a positive impact on my life. Anziano Castro then came in with the most amazing testimony and they happily agreed to take them. It was the coolest experience and let me know that God answers our prayers and is guiding us to where we need to go so that we can meet the people we need to meet. Secondly, we had another really cool experience on Thursday when we did a scambio with the zone leaders (since Anziano Castro is the district leader). We started Thursday evening with me staying in our area with Anziano Baker. Well, we had a lesson with Ali our Egyptian investigator so we went right away to the Colosseum to meet him. As we were walking by we met a returned missionary who had served here 6 years ago. He is actually from Green River which was kind of cool. He wanted a picture with us and then we headed on our way. It was only a small moment and soon I forgot about the whole thing as we went on with the scambio. About 24 hours later we were finishing the scambio and me and Anziano Baker were on the metro heading to our predetermined meeting point where we would re-swap companions. I was sitting down on the metro and Anziano Baker had just finished talking to a man when another man, who I noticed had been listening to their conversation, pulled out his smart phone and asked Anziano Baker, "Ma questi siete voi?" (Is this you guys?) Anziano Baker just had the most shocked look on his face. I got up and walked over to see what they were looking at and I saw on this man's phone on his Facebook, a picture of me and Anziano Baker with that returned missionary from the day before, standing in front of the Colosseum!!!! It was the craziest most unbelievable moment ever!! Turns out that man was a convert of that returned missionary 6 years ago! They were friends on Facebook and somehow within a 24-hour period we ended up running into both of them and in the most miraculous way!!!! Hah the sad part is this man has since stopped going to church. He didn't even want to meet with the missionaries, but still he gave us his Facebook so who knows! Obviously some pretty miraculous things can really happen on Facebook!  I know the fact that we met was for a reason. We will do the best we can and just pray for him and pray that we can have patience. Anyways, those were just two miracles from this week. 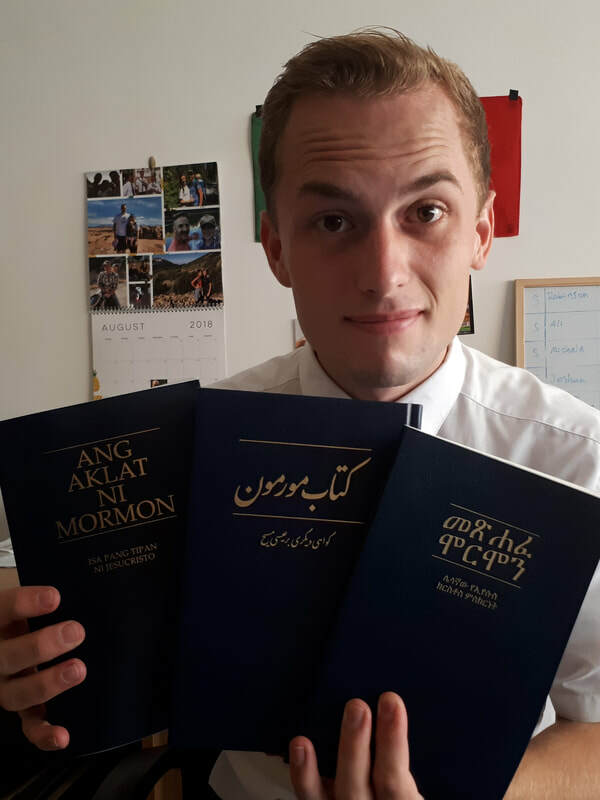 My last note is: this week I finished reading Il Libro di Mormon (The Book of Mormon) in Italian for the first time! I was so excited!!! It has been an adventure from reading those first verses in the MTC and understanding less of the Isaiah chapters than I ever have, until the last chapters of the book of Moroni where I sometimes would almost forget what language I was reading in. I know that my Italian isn't the only thing that Book has helped me with. :) That book has shaped me as a person and missionary. I am not the same person I was when I first started reading it. I know it is true because I followed the instructions in Moroni 10 and prayed after I read it and I felt in my heart the spirit telling me it is true. I invite you all to read it and pray about it. I am just going to write really quickly because we have a short p-day today. Wednesday is Ferragosto so pretty everything is closed and it's also that time where the mission wants us to do a deep cleaner of our apartments. So since we will be doing that on Wednesday we have a shorter p-day today so we can get more work done. One quick story, this past week we did an finding exercise with some other missionaries in our zone on the metro. So we got into pairs and then basically did a loop. We would get on at a stop called Repubblica ride it three stops down to a stop called Flaminio (it takes about 4 minutes) and then at Flaminio we would walk over to the metro going the opposite direction and ride it back to Repubblica. We did this riding back and forth between the two stops for about 40 minutes. The objective was to get on and then just start a conversation with someone. We would do our best to bring up the gospel and get their number and then get off at Repubblica or Flaminio depending on which direction we were going. We could stay on the metro and ride down farther with them if we felt really impressed to, but then we would return back and keep doing the loop between Repubblica and Flaminio. What we did we actually is we had each companionship take a different train (the trains pass like every 2 minutes) and then the companions were even advised to spread out just a bit from each other (obviously still within sight and sound) on the metro. It was such an amazing practice to just discover how I personally like approaching people and doing finding. 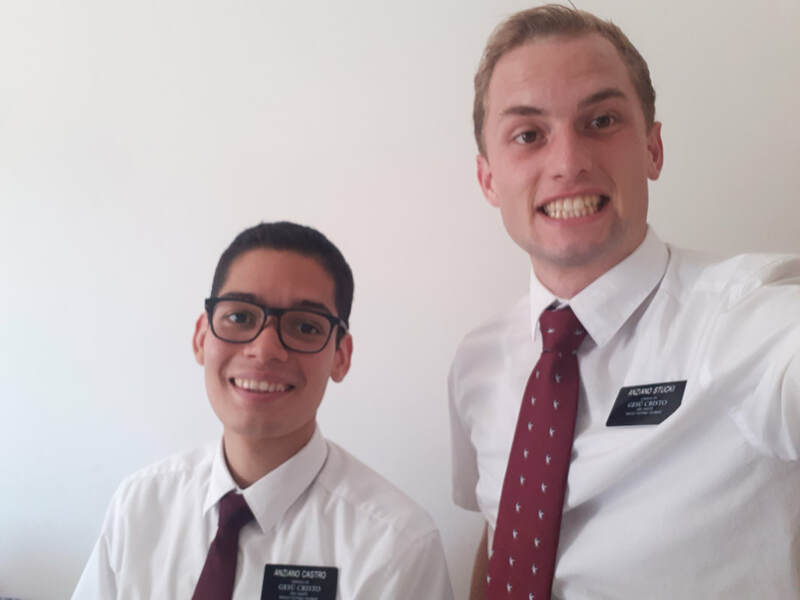 I felt more free not having another missionary right beside me so I could just relax and focus on the person I wanted to talk to. After this exercise we all regrouped and then discussed tips or tricks we discovered. I loved it a lot! It made me really examine how I do things. I loved how they just encouraged us to be ourselves as we approached these people. We are all missionaries, but we are different people with different gifts and we each bring things to the table. Anyways, I just wanted to share that with y'all because I thought it was so interesting and I want to add my testimony that there are people who want to hear this message and we are all called to stand as witnesses and share it. I know God helps us. Alma 32:27 "But behold, if ye will awake and arouse your faculties, even to an experiment upon my words, and exercise a particle of faith, yea, even if ye can no more than desire..., let this desire work in you, even until ye believe in a manner that ye can...."
We got to pass by the temple this week and while we were there in the little information center/trailer it started raining and thundering like crazy! We did a new kind of "gesso" called Sticker Boarding. It was so fun! The question written on it is, "What makes you happy?" Then there are options under it. Pretty much we just stood there on this really busy street in Rome (Via Del Corso) with sticker sheets and invited people to put a sticker under the desired response. A lot of people really liked it and it was a fun way to start a lot of gospel conversations. That street is a very touristy one. Anziano Castro just went crazy talking different languages to all the different people. Haha btw the options on the Sticker Board starting from the left are, "Family, Music, God, Hobbies." Grateful for an opportunity to learn and come closer to the Savior, Neal shares his mission experience with us.